How will I know if I have hepatitis A? How will I know if I am cured of hepatitis A? When should I contact a doctor about hepatitis A? Hepatitis A is a type of liver infection caused by a virus termed hepatitis A (HAV). For clarity, the disease will be termed hepatitis A while the viral cause will be termed HAV. Hepatitis A is a self-limited disease that does not cause chronic disease in contrast to some other viral causes of hepatitis. Antibodies produced during infection give life-long protection against the disease; there is an effective vaccine against HAV. Rarely, hepatitis may lead to liver failure and death. Hepatitis A is very contagious. People can be contagious even before symptoms appear. However, the numbers of individuals diagnosed with hepatitis A has been decreasing since the vaccine against HAV was introduced in 1995. The vaccine is effective in adults and children. Symptoms develop over a few days and in mild infections, last about 4 to 6 weeks with more severe infections lasting about 6 months. Your physician can diagnose hepatitis A by your history, physical exam, and blood tests. HAV viruses can live outside the human body for months in the environment. In general, once symptoms of hepatitis A begin to abate, individuals are considered to be non-contagious; resolution of the infection results in a cure and life-long immunity to the disease. Appropriate vaccination (usually 2 shots 6 months apart), can also give long-term immunity to the disease. If you have recently been exposed to a source of HAV and are unsure if you are vaccinated, contact your health-care professional, as it is possible to get vaccine or even immunoglobulin treatment to prevent the disease and/or its symptoms. If you have the disease, contact your health-care professional for symptomatic treatment methods (for example, diet changes, avoiding alcohol, certain drugs) to help prevent HAV spread to family and friends. Some individuals have more severe symptoms and may need to be hospitalized. REFERENCE: Samji, N. MD. "Viral Hepatitis." Medscape. Updated: Jun 12, 2017. Please share your experience with hepatitis A. What symptoms did you have with hepatitis A infection? If known, how did you contract hepatitis A? Hepatitis means inflammation of the liver. Hepatitis A (HAV, Hep A) is one type of liver disease caused by a virus. Since hepatitis A is a virus, it can pass from person to person from eating or drinking contaminated food or coming into contact with contaminated materials containing the virus. Symptoms of hepatitis A include stomach pain, diarrhea, dark yellow urine, jaundice, and more. There is a vaccine to prevent contracting hepatitis A. 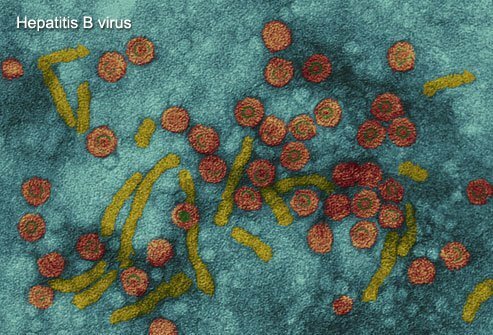 The hepatitis B virus (HBV, hep B) is a unique, coated DNA virus belonging to the Hepadnaviridae family of viruses. The course of the virus is determined primarily by the age at which the infection is acquired and the interaction between the virus and the body's immune system. Successful treatment is associated with a reduction in liver injury and fibrosis (scarring), a decreased likelihood of developing cirrhosis and its complications, including liver cancer, and a prolonged survival. Hepatitis is inflammation of the liver. There are a variety of toxins, diseases, illicit drugs, medications, bacterial and viral infections, and heavy alcohol use can case inflammation of the liver. Hepatitis C viral infection (HCV) is one type of hepatitis. According to the CDC, in 2014 there were an estimated 30,500 cases of acute hepatitis C infections in the US. An estimated 2.7-3.9 million people in the US have chronic hepatitis C. The virus is spread from person-to-person via blood-to-blood contact. Symptoms of HCV infection include joint pain, jaundice, dark urine, nausea, fatigue, fever, loss of appetites, clay colored stool. Hepatitis C can be cured with medications in most people. There is no vaccine against the hepatitis C virus. Labyrinthitis is inflammation of the labyrinth (the part of the ear responsible for balance and hearing). Doctors do not know the exact cause of labyrinthitis; however, they often are associated viral infections of the inner ear. Symptoms of labyrinthitis are ear pain or earache, ear discharge, problems with balance and walking, ringing in the ears, dizziness, nausea, vomiting, and vertigo. Viral infections associated with labyrinthitis are contagious. Home remedies may help labyrinthitis symptoms and signs. Over-the-counter (OTC) and prescription medication may treat inner ear infections, labyrinthitis symptoms like vertigo and nausea, and help ear pain. Hepatitis is most often viral, due to infection with one of the hepatitis viruses (A, B, C, D, E, F (not confirmed), and G) or another virus (such as those that cause infectious mononucleosis, cytomegalovirus disease). The main nonviral causes of hepatitis are alcohol and drugs. Many patients infected with hepatitis A, B, and C have few or no symptoms of illness. For those who do develop symptoms of viral hepatitis, the most common are flu- like symptoms including: loss of appetite, nausea, vomiting, fever, weakness, tiredness, and aching in the abdomen. Treatment of viral hepatitis is dependant on the type of hepatitis.